What Will 1&1 Mean for Your Students? MREA prefers mix of formula, targeted funding for facilities and School Districts without QComp to address the TDE requirements, and tax base equalization for Rural Education. The reality is that 1 percent and 1 percent, commonly referred to as 1&1, is inadequate. If Minnesota elected leaders invested half the $1.9 billion surplus for education, they could address facilities, TDE, move towards universal preschool, and provide sufficient K-12 resources to pay our teachers and other staff as we should be able to. That’s the type of investment Minnesota needs in education and Gov. Dayton’s plan comes the closest. Learn more about the Targets. What will the impact be on your students? MREA asks that school districts begin calculating the projected effects of 1&1 on their budgets, staffing, and students. MREA will send a short survey to superintendents to gather the results. Time will be of the essence. The education finance bills will need to be approved by the respective education finance committees by April 24. MREA will need the help of Greater Minnesota schools in advocating for your students. 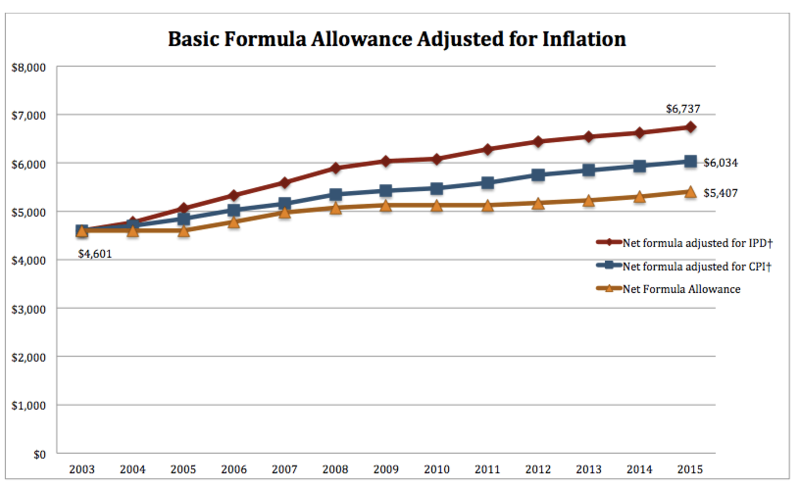 Compounding the impact of 1&1 is the past 12 years in which the formula has not kept up with inflation. Learn more in this chart (also to the right) from the Association of Metropolitan School Districts (AMSD). The House education target of $157 million won’t fund even 1&1. The Senate at $350 million isn’t much better. MREA will publicize the results from the superintendent surveys to show the effects across Greater Minnesota on students education.